The Team of BIELUGA Expedition 2006 has safely returned to Poland. Now the toilsome work of processing the rich photo, film , and information coverage is ahead of us. Soon the first films and photos from the journey will be published on the websites of BIELUGA and Off-Road magazine. Extensive reports will be published in the October, September and November issues of OFF-ROAD PL magazine. See first photo gallery from BIELUGA Expedition 2006 published on the OFF-ROAD PL magazine website. Bieluga Expedition 2006 coverage stories will be available in English soon! Expedition releases (in Polish) are available in the PRESS ROOM section. Yet another success for Bieluga! There are three press articles on the expedition curently available at newsstands - in Warsaw Business Journal, Off-Road and Globetrotter magazine. Soon, there will be new articles, novelties and a couple of changes - certainly for the better! PREMIERE of BRAND NEW VIRTUAL EXPEDITION! We've been working on it for four months! Over 1000 photos, almost 100 videos, hundreds of comments, descriptions and stories from BIELUGA Expedition - all of it will be available for every net surfer after coming back from this year's expedition. The bulk of materials is already available! Virtual Expedition, the biggest project of this type, is created in two languages by over twenty people and institutions: travelers, computer scientists, graphic artists, translators, academic institutes, polish and foreign 4x4 clubs and Wikipedia - The Free Encyclopedia. See more! You can read about the idea of the Project in the March edition of OFF-ROAD.PL - polish magazine about off-road. We strongly recommend! As of today, the presentation of this year's expedition, including an updated MAP is available at BIELUGA's website. A link to download a PDF file can be found in every website's footer. Any day now we will see the publication of the Off-Road PL monthly's newest issue with an extensive article on BIELUGA Expedition 2006. Download the presentation. BIELUGA's another big success - The Embassy of the Republic of Moldova in the Republic of Poland hosted a meeting during which concluding remarks were presented as far as the cooperation within BIELUGA Expedition 2006 is concerned. Cooperation with Moldova' s authorities will enable us to plan out a much more interesting route through regions that are normally inaccessible for an average tourist. It will also help to enrich the Project's informative part with materials rendered accessible by competent state institutions. The premiere of this year's Expedition is already available in the March issue of the Off-Road PL Magazine! Intense preparations to BIELUGA Expedition 2006 have been going on for three months now. We can reveal that the destination of the July journey is Georgia, with guaranteed adventures and exotic places. Thanks to the success of the first edition, the bulk of last year's participants and partners have already confirmed their participation in the second part of the project. 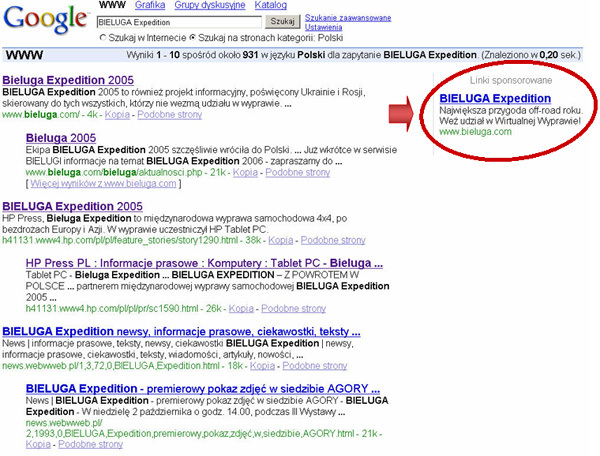 The last day of 2005 saw the launch of BIELUGA's advertising campaign in the Google search engine. The campaign's objective is to enhance the Project's informative part through directly reaching those who search for information about the countries and regions on the routes of successive Expeditions. See an sample advertisement in Polish. We have added the last Kalmykian gallery. Starting from today pictures from the entire route of BIELUGA 2005 are available on Virtual Expedition - more than 500 photos altogether. Soon we are going to place further news and information on BIELUGA Expedition 2006 on our website! We have added another photo series - this time from Caucasus. Ruts, mud avalanches, boulders and almost 40 crossed fords. Soon we will make available the last missing gallery - steppes, salt lakes and deserts of Kalmykia. On Wednesday, November 23, a meeting was held summarizing the cooperation of BIELUGA Expedition and Michelin Polska SA. The Expedition organizers presented tangible effects of the cooperation and the results of the practical test of BF Goodrich tires that all the cars were equipped with. The meeting will result in a significant extension of cooperation within BIELUGA Expedition 2006. A press conference devoted to the Global Positioning Systems was held in the seat of Hewlett Packard Polish branch. One of the three presentations shown to journalists was the multi media demonstration of pictures and films from BIELUGA Expedition 2005. By the end of the week two most off-road photo galleries from Caucasus and Kalmykia will be placed on Virtual Expedition. Almost 200 pictures from Gorgany, Crimea, and cross-sectional return route are now accessible. A report summarizing this year's edition of BIELUGA Expedition will be published in the upcoming issue of Off-Road PL monthly, BIELUGA's media patron. Michal Rej, the expedition's participant, will present on six pages the Asian part of the adventure. The article will be illustrated with pictures and satellite simulations of the route so far unpublished. Currently, the October issue with the first part of the article is available for sale in Poland. An extensive article in the form of a case study into BIELUGA Expedition 2005 has been published in the current issue of Piar.pl, Polish bimonthly Public Relations magazine. At 2 pm on Sunday, October 2, at the Third Exhibition of Cross-Country Vehicles, you will be able to see the PREMIERE PRESENTATION OF PICTURES from BIELUGA Expedition 2005. The Exhibition will be held in the seat of Agora, one of Poland's biggest media firms, at Czerska Street 8/10 in Warsaw, October 1-2, 2005. 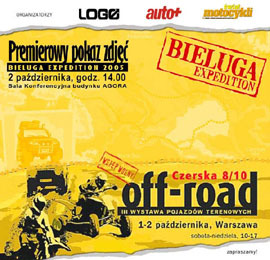 The Exhibition will give you a chance to meet the participants and organizers of BIELUGA Expedition 2005, see the Mobile Press Office, and, what's most important, talk about off-road and journeys to faraway places. We look forward to meeting you there! More in Polish. The presentation of BIELUGA photos has been postponed for technical reasons. Information on the new date of the premiere will be published on our website next week. Already in four days time, on September 2 (Thursday) a few hundred photos from this year's BIELUGA route will be put in the Virtual Expedition section.. Enjoy the presentation! The international company HP, which is also the official Partner of the Project will welcome visitors to the firm's Polish website to see the report from the expedition in mid August. See the new layout of HP home website. The Team of BIELUGA Expedition 2005 has safely returned to Poland. Now the toilsome work of processing the rich photo, film , and information coverage is ahead of us. Soon the first films and photos from the journey will be published on the websites of BIELUGA and Off-Road magazine. Extensive reports will be published in the October issue of OFF-ROAD PL magazine. Information on BIELUGA Expedition 2006 soon on BIELUGA website - your cooperation is more than welcome! Tomorrow, at 9am, the BIELUGA Expedition participants are setting off from Warsaw. At the time of the Expedition, any reports, news and extra materials will only be available in the . PRESS ROOM section Visit the website! Leon Kozminski Academy of Entrepreneurship and Management in Warsaw, which is one of Poland's most prestigious private universities, is the partner of BIELUGA Expedition. Thanks to our cooperation a non-stop open press office will be launched in the Academy's premises. HP company, the world's leading supplier of technical solutions for individual customers, companies and institutions has joined the group of BIELUGA's partners. HP offer includes IT infrastructure, Personal Computers and access devices, global services and printing and imaging solutions. As part of the cooperation the Expedition's mobile press office will be equipped with modern computers adapted to difficult conditions of a journey. The organizers are in final negotiations concerning close cooperation with two international corporations from the automotive and electronics sectors. More information coming soon. Today at noon took place a premiere show of the film series shot during BIELUGA reconnaissance trip. A section on the Crimea route is available on the partner website of the OFF-ROAD PL monthly. The remaining films are coming soon on our website! Wirtualnemedia.pl - Polish biggest information portal devoted to television, radio, press, internet and advertising, has joined the group of BIELUGA's media patrons. Thanks to the cooperation we can fully develop the project's informative part. Soon BIELUGA's advertising campaign directed at 27,000 people will be launched on the portal's website. We are spending next Saturday at the Motorized Travelers' Rally in Srebrna Gora in the south of Poland, at which presentations of journeys to Russia, Mongolia, Australia, Africa, and many other splendid regions will be demonstrated. Our show will consist of photos, slides, and films from Siberia, Georgia, Ukraine, and Kalmykia. We invite you on behalf of the Organizers! More information on www.autowyprawy.com. An extensive trailer of the Expedition was published in the Off-Road PL magazine - see the article. (in Polish). Five Polish teams are already getting prepared for BIELUGA! Each of them is formed by experienced travelers, who have already been to off-road expeditions across Australia, Chile, Georgia, Malaysia, Peru, Russia, Ukraine and many other countries. Amateur teams will find out the details during informative meetings, which take place in Warsaw. Anyone who is just at the start of their expedition adventure can arrange a meeting and receive full support from experienced travelers. Everyday, starting from Tuesday May 10, 2005 in "Aktualnosci" (News) we will be presenting current events connected with the Expedition preparations. And indeed, there is a lot to write about - meetings with the participants, inaugurating BIELUGA at a cross-country event of the Toyota Land Cruiser owners, new Patrons and Partners. You are now invited to subscribe to the Expedition's free newsletter (at the bottom of the left column). What you will find there is information normally not to be accessed from the website, films, three-dimension simulations from the route and other interesting news.